This fine tobacco originally had no name. It was blended before the first World War especially for the Very Rev. Dr. John White, sometime minister of the Barony Kirk in Glasgow and Moderator of the General Assembly in Scotland in 1929. He introduced it to Stanley Baldwin, later Earl Baldwin, Prime Minister in 1923, 1924 and 1935. He liked it so much that regular supplies were sent down to him and it was he who suggested that it be called "Presbyterian Mixture". Due to limited availability, there's a limit of 25 per customer per day for this item. 3% off 5+ Tins: $9.70 ea. 5% off 10+ Tins: $9.50 ea. 6% off 20+ Tins: $9.40 ea. Now I'm the first to admit that this review may be quite subjective - but this tobacco has made it to the top of my list and has become my all-day smoke; to the extent that I'm hesitant filling my pipe with any of the other great tobaccos in my co... Read More llection. 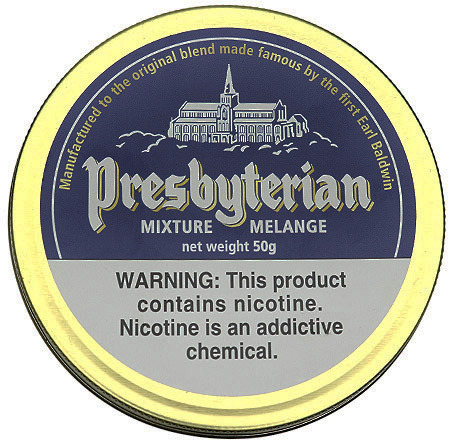 I love everything about Presbyterian, starting with opening the tin, feasting my eyes on the coarsely cut mixture of bright and dark leaves. This is accompanied by the delicious musty, earthy, and spicy aroma. The cut is ideal for the way I fill my pipe (similar, but not identical, to the 'air pocket' method). The tobacco lights easily, even when slightly moist from a freshly opened tin. When it has dried out just a little, it can be smoked all the way down from the first light, although I would rarely smoke a bowl in one sitting; that is no problem though, as it maintains its delicious taste and aroma, even after cooling down and sitting for some time before a relight. As a lover of Orientals, I find these tobaccos to be the star of the show, perfectly complemented by the Latakia and Virginia. 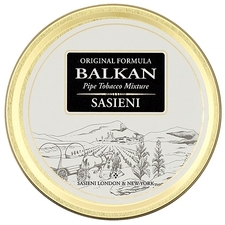 I have always loved Latakia, and still do, but these days I prefer its use as a condiment rather than a major ingredient (as found in many English and Balkan blends); and in this regard, Presbyterian really shines. 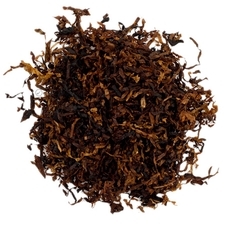 The components combine to give the tobacco a somewhat sweet, almost aromatic note, but one can sense that it is all natural, without any casing or flavoring. 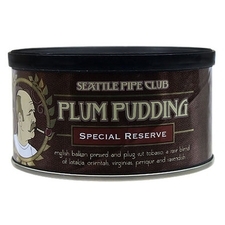 I love retro-haling, and this brings out even more flavors, adding a delightfully pungent note to the smoke; and to me that must be Presbytarian's greatest achievement - providing so many delicious flavors without resorting to anything artificial. As a previous reviewer has mentioned, my main regret is the fact that it is not available in bulk. 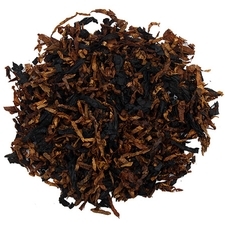 This is a top notch tobacco; it’s earthy, smoky, spicy and just a little sour. I think it benefits from a hour of drying time, just to let it breathe a bit. 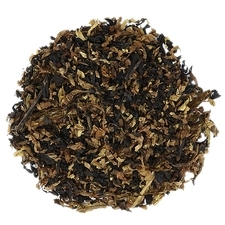 This is my go-to blend for a latakia and oriental English blend. This has become my favorite tobacco, from the earthy tin aroma to the, to me,very pleasant flavor and room note. My must have. The Original was better ! Needs drying time out of the tin. Always was Oriental heavy but something has changed. Can smoke a bit hot, theres better than this even in bulk blends. I got a sample from The Tin Society. Smoked one bowl and bought two tins. Its hands down the best tobacco I've tried in the last year of smoking pipes. Very tastey, virginas roaming about a mild campfire with a little spice here or there, some sweetness and good body. Presbyterian is hands down my favorite english blend, which I have smoked regularly since 2009. It has a robust "spicyness" that is quite enjoyable, but is quite mellow as you smoke it. Very pleasant and good any time of day. A wonderful tin of tobacco to have on hand. A light blend that reminds me of Dunhill's Standard Mixture, but less spicy and a lighter taste. 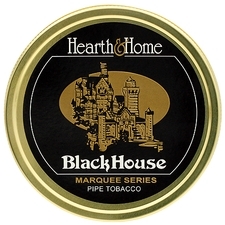 This tobacco came highly recommend to me, and I had very high (and disappointed) expectations. I have nothing to say other than it came as a very dry, London-type blend that smoked way too fast and hot. Old Name. Easy to approach English Mixture. I find this is a high quality tobacco, however it is very similar to Erik Stokkebye 1882 blend which I favor over this blend. Enjoy!!! I confess This stuff is good! This tobacco has divine taste. Perfectly balanced blend for me. My go to alternate to Pirate Kake. This is an all day blend that will have you craving more. I smoke this blend just near every day and never really get tired of it. 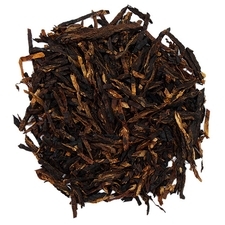 It's a very mild English blend, but has a great flavour that I can't get enough of. Not a special treat for me, just a well-rounded and quality blend. One of my all time favorite blends. Earthy, savory, with the perfect amount of latakia. The perfect smoke to enjoy a rainy autumn evening. No wonder it’s been around so long! Like others have said, earthy, spicy tin note. Full flavored. 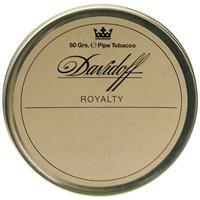 In casing pure tobacco taste. Orientals are star here. What else would you expect?! I find this blend boring. It doesn't have taste at all. I was looking forward to this blend do to the high review ratings. It almost tastes like a cigarette . It does smokes well out of the tin . I would suggest trying it , but it's not for me. I'm not sure what all the fuss is about. I was exctied to try this blend for the first time until I actually lit a bowl... no taste whatsoever. Just felt the smoke in my mouth and that was it. Quality of tobacco and tin note was decent. It's a good light Latakia mixture. The oriental in it is a bit more heavy than I would like for all day but if that tickles your palate, then go for this one. This is a very balanced well constructed blend similar to Lane Crown Achievement. No surprises or shockers just a good smoke.